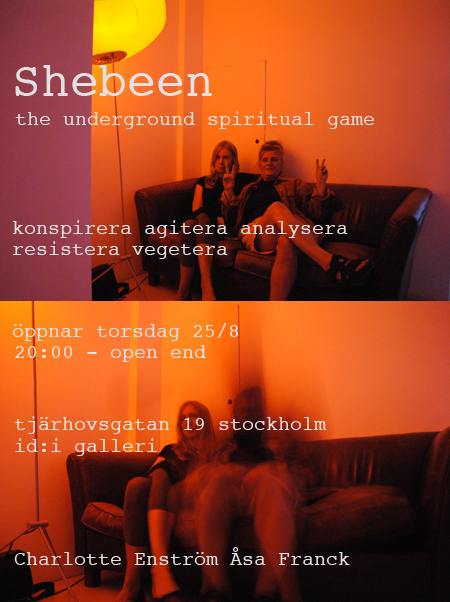 Konspirera, agitera, analysera, resistera, vegetera på Stockholms första och enda Shebeen – the underground spiritual game av Charlotte Enström och Åsa Franck. ”In South Africa and Zimbabwe, shebeens are most often located in black townships as an alternative to pubs and bars, where under apartheid and the Rhodesian era, black Africans could not enter a pub or bar reserved for whites. Originally, shebeens were operated illegally, selling homebrewed and home-distilled alcohol and providing patrons with a place to meet and discuss political and social issues. Often, patrons and owners were arrested by the police, though the shebeens were frequently reopened because of their importance in unifying the community and providing a safe place for discussion. During the apartheid era shebeens became a crucial meeting place for activists, some attracting working class activists and community members, while others attracted lawyers, doctors and musicians. Shebeens also provided music and dancing, allowing patrons to express themselves culturally”.